You have the option of booking a bus for the party to match the number of people you want to accommodate. So if your have a smaller group of friends, you can opt of hiring a limousine or a minibus, but if you invite everyone you know, there is enough space in our large party buses to deal with. FL Limousine carries buses up to 50 pass in Palm Beach area. You can arrange the bus to catch everyone in one particular place. Then, when the event ends, a professional driver will return to the reception point, safely and silently, without having to worry about someone drinking or driving. Party Buses West Palm Beach are a good way to ensure everyone’s safety while spending time together. You can enjoy drinking champagne, wine, beer, and other alcoholic beverages without having to worry about hiring a particular driver. All your friends and family can drink as much as they want without endangering others because FL Limousine will appoint a responsible driver for the night. You can get drinks inside the bus with you and enjoy the entire ride. FL Limousine offers new buses and professional drivers that will take care of you and your entire group. 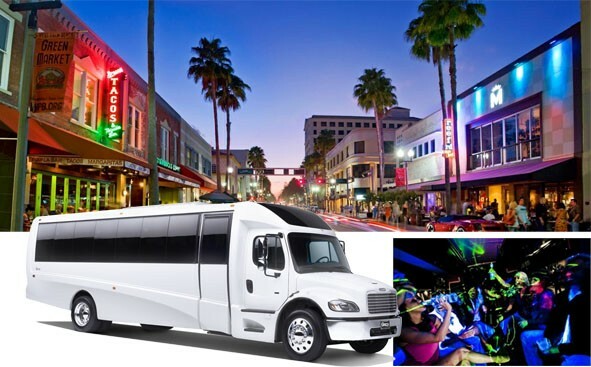 Considering renting a party bus in West Palm Beach area? Great choice, as the buses are one of the safest driving options. Our trained drivers will take care of all safety regulations. You can use a party bus all over the city, not limited to one place. When renting a limousine bus, you can move from club to club at night, or your entire family can use it for travel from the wedding to the reception. The bus makes it easy to visit various places in the city, without worrying about the fact that someone is missing or losing some fun, which means the whole event is just more fun altogether. Hope on the bus and go see the Improv Comedy Club in West Palm Beach, or go from bar to bar, the fun is yours, the driving is on us! Perfect for any occasion. Whether you need something special for a wedding, a birthday party, or an occasional bus commencement, will give you the special experience you need to make this event memorable. It is also ideal for retirement parties, graduate parties, anniversaries and all kinds or celebrations. Let’s go back to the last chance you hosted an event in your home. You probably have made every effort to clean your home and decorate and prepare snacks. Later I stayed with a lot of chaos and potential damage to the property. Using a cheap party bus in West Palm Beach will have you spend so much less, work less and enjoy more. Quick booking options and a great customer service will organize an excellent holiday party quickly by simply taking just few details. There is simply no other company around that offers same commitment and dedication to the work, as we do. West Palm Beach Party Buses are equipped with leather seats, a 3D stereo system and LCD TV screens they permit you to have fun, enjoy a snack and entertainment. Going to a concert will set the mood right from the start, you will have the choice to convert your party into the concert while being in the bus. The atmosphere, the people, the ambiance is so fun that you will not want to stop the ride! Opting to a party bus in the county of Palm Beach is definitely the GO move and will have all eyes on you. Who doesn’t love the attention and the feeling that they’re important. Do not think twice and walk around to go for a unique fashion event and style. Forget waiting in line to reach to the most important clubs in town. When driving in the bus, the party bus opens all doors for you, you can move to the front of the line each time. Ask us about VIP access into the club. Now how wonderful is this? You can safely get transportation and entertainment when you are on board. In addition, this experience does not cost a fortune. If you travel with a large group of friends and share prices, the cost will be less expensive and even affordable. If you are looking for a good way to make the your travel experience more enjoyable, consider hiring Party Bus Rental West Palm Beach for the evening. You and your friends will always share the fun times and will smile to the memories.